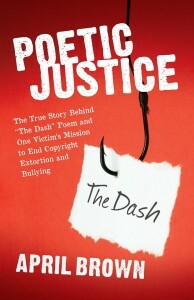 On January 30, 2015, April Brown, released on YouTube a colorful, humorous, and rather entertaining book trailer for her book, “Poetic Justice”. However, under the color, animation, and humor lies a very real and serious message. Normally, I would not write a blog post over an ordinary book trailer but April, in her own inimitable style, has created a very special book trailer. It is short, informative, easy to understand, and encapsulates April’s (and others’) experience of innocently sharing Linda Ellis’ Dash Poem. I stand by April’s message that Ellis’ viral Dash Poem has a dark, ugly, and financially catastrophic consequence to anyone who foolishly shares that poem in print within a newsletter, book, or a website. Do take down the Dash Poem. Do not respond to any demands for payment. Do yourself a favor. Watch the video. Get educated. And do share this video. I promise you April will not send you any letters demanding $7,500. In fact, she will be happy if you shared the video FREELY.